As you can see from the following statistics, the Real Estate market in the Eugene and Springfield area remains very strong. 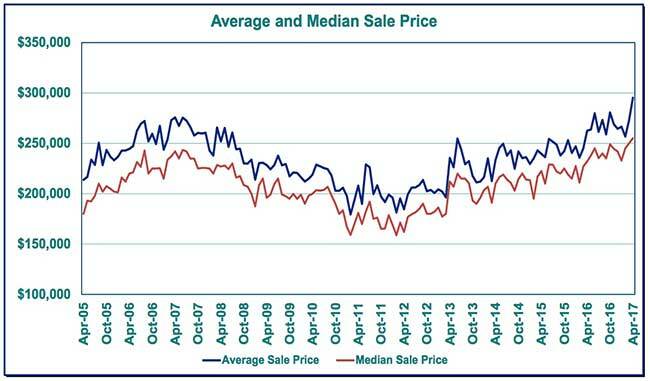 The largest obstacle at this time is that there is only 1.7 months of active inventory of homes for sale. This is critically low number and it is creating a shortage of affordable homes for would-be buyers. For anyone considering the sale of their home, there just could not be a better market. If you are considering the sale of your home, don't wait, get your home on the market "NOW" and take advantage of this very strong sellers market. Here are December's Lane County home sales numbers. Lane County saw increases across the board this December compared to 2016 despite some cooling from last month. New listings (223) ended 3.7% ahead of December 2016 (215) but fell 35.4% sort of the 345 new listings o ered last month in November 2017. Pending sales (309) fared similarly, increasing 24.1% from the accepted o ers recorded in December 2016 (249) but falling 15.6% short of the 366 offers accepted last month in November 2017. Closed sales (371) ended one ahead of the 370 sales recorded last year in December 2016 (0.3%) but were 5.8% short of the 394 closings recorded last month in November 2017. Activity ended slightly ahead in 2017 compared to 2016. Comparing the entirety of each year, new listings (6,390) increased 3.5%, closed sales (5,204) increased 0.8%, and pending sales (5,254) increased 0.2%. Comparing all of 2017 to 2016, the average sale price rose 9.2% from $263,700 to $287,900. In the same comparison, the median sale price rose 9.7% from $237,000 to $260,000. May of 2017 showed as a very strong month for the Eugene and Springfield area housing market. 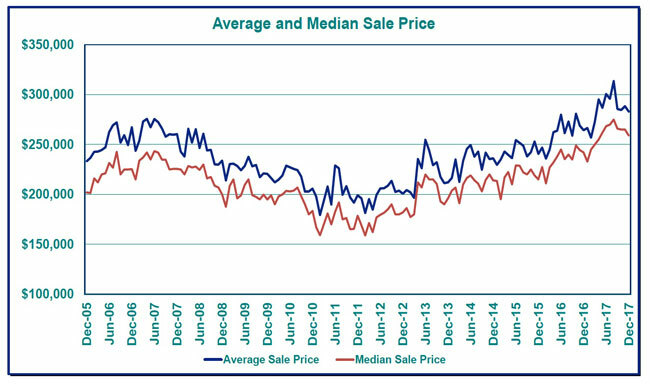 Home sale were up and home price continued to increase. With home pricing up at near 10% over the last year, home affordability may be a huge factor in the coming months. Here is the May 2017 home sales report for Lane County. Lane County had strong activity across the board this May. New listings (752) outpaced May 2016 (657) by 14.5% and April 2017 (577) by 30.3%. The last May that saw new listings as strong was in 2007, when 804 new listings were offered for the month. Pending sales (638) bested May 2016 (567) by 12.5% and April 2017 (488) by 30.7%.—the strongest May on the RMLS record, which dates to 2001. Closed sales (444) were less strong, but still edged 0.7% over the 441 closings from May 2016 and 23.0% over the 361 closings recorded last month in April 2017. Total market time decreased to 51 days in May, with inventory slimming slightly to 1.6 months. Comparing the first five months in 2017 to the same period in 2016, new listings (2,642) have decreased 2.0%, closed sales (1,765) have decreased 3.1%, and pending sales (2,220) have decreased 4.4%. Comparing 2017 to 2016 through May of each year, the average sale price rose 9.7% from $252,800 to $277,300. In the same comparison, the median sale price rose 8.7% from $229,900 to $250,000. April Real Estate activity in the Eugene and Springfield market area was up slightly over March of this year, but running behind April of a year ago. Low inventories of homes for sale and an average home price increase of nearly 10% over last year are the culprits. 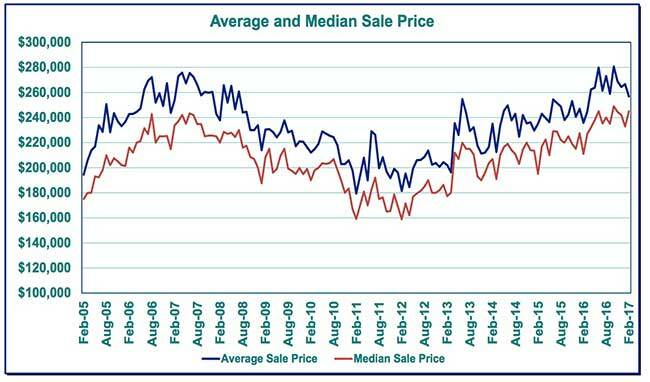 We are in a strange market right now with extremely low inventories of homes for sale and rising home prices. I don't want to sound the alarm, but this is a dangerous spiral and it could result in a quickly declining market at some time. 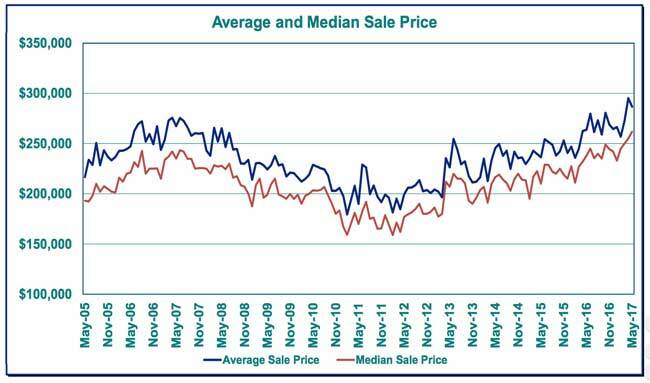 When home prices become non-affordable, sales decline and price come down. What happens in our local market over the next several months should tell us the story about where we are heading. Here are the numbers from April. Lane County saw some warmer activity again this April, although numbers are a bit cooler compared to April 2016. New listings, at 577, ended 1.5% below April 2016 (586) but 7.4% ahead of March 2017 (537). Pending sales, at 488, decreased 11.8% compared to April 2016 (553) but edged 2.1% ahead of the 478 o ers accepted last month in March 2017. Similarly, closed sales (361) had a 10.0% decrease from the 401 closings recorded last year in April 2016 but pulled 1.7% ahead of the 355 closings recorded last month in March 2017. Inventory crawled upward in April, ending at 1.8 months. Meanwhile, total market time decreased by 13 days, landing at 56 days. Comparing the average price of homes in the twelve months ending April 30th of this year ($270,400) with the average price of homes sold in the twelve months ending April 2016 ($246,700) shows an increase of 9.6%. The same comparison of the median shows an increase of 8.4% over that same period. Here are the numbers for the February 2017 Real Estate market in the Eugene and Springfield area. As you can see, there was little change. The inventory of homes for sale remains critically low and the result is fewer sales and higher home prices. The Eugene/Springfield area remains as one of the lowest areas in the country for active homes for sale at just 2.2 months of active inventory available. All that I can say is the same thing that I have been saying. If you are thinking about selling your home in the near future, this is the top of the market for home pricing and you should take advantage of it. Here are the numbers for February. Activity in Lane County continued a cooling trend this February, but some numbers showed gains over January. New listings (393) showed a 22.8% gain over January 2017 but ended 5.5% below the 416 new listings offered last year in February 2016. Similarly, pending sales (369) rose 16.0% above the 318 orders accepted last month in January 2017 but were 12.1% under the 420 orders accepted last year in February 2016. Closed sales, at 247, ended 13.0% under February 2016 (284) and 9.5% under January 2017 (273). February saw inventory in Lane County rise just slightly to 2.2 months. Total market time during the same period rose three days to 75 days. Comparing the average price of homes in the twelve months ending February 28th of this year ($266,000) with the average price of homes sold in the twelve months ending February 2016 ($244,400) shows an increase of 8.8%. The same comparison of the median shows an increase of 8.3% over that same period.